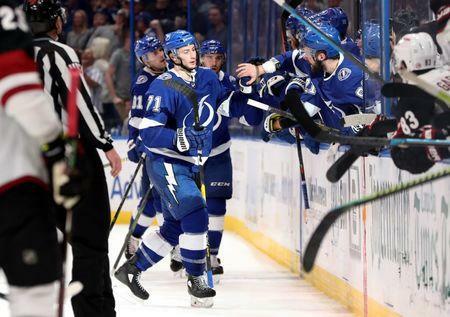 Tampa Bay earned its first-ever Presidents' Trophy, and Steven Stamkos set a franchise record for the most goals as the Lightning beat the visiting Arizona Coyotes 4-1 on Monday night. Victor Hedman's goal in the first minute of the third period broke a 1-1 tie, and Tampa Bay's top-ranked penalty-kill held Arizona scoreless with the man advantage in the game's last 1:39. Anthony Cirelli, who also had an assist, and Yanni Gourde each produced short-handed, empty-net goals in the final minute. Stamkos, 29, scored the game's second goal of the first period. His 384th career tally broke the franchise record for goals previously held by Vincent Lecavalier, who was a member of the Lightning for 14 seasons. Stamkos is in his 11th season. The Lightning, who improved to 31-6-2 on home ice secured the No. 1 seed for the postseason. They became the second-fastest ever to notch the Presidents' Trophy, doing it in their 73rd game. The 1995-96 Detroit Red Wings did it in 71 games. 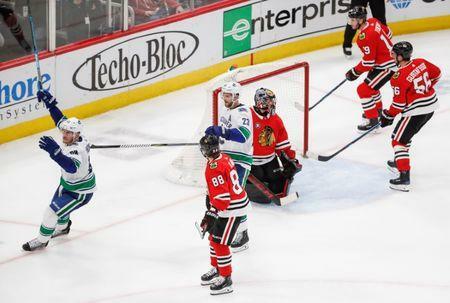 Bo Horvat scored 16 seconds into overtime to lift Vancouver to a victory at Chicago. Horvat buried his 25th goal of the season with a shot from point-blank range on the Canucks' first chance of the extra session. Alexander Edler and Markus Granlund also scored for Vancouver, which won its second game in as many nights. Thatcher Demko earned his third career victory by stopping 29 of 31 shots. Jonathan Toews and Erik Gustafsson scored for the Blackhawks, whose five-game winning streak came to an end. Patrick Kane tallied assists on both Blackhawks goals, giving him 101 points (41 goals, 60 assists) on the season. Chicago's Corey Crawford stopped 31 shots. 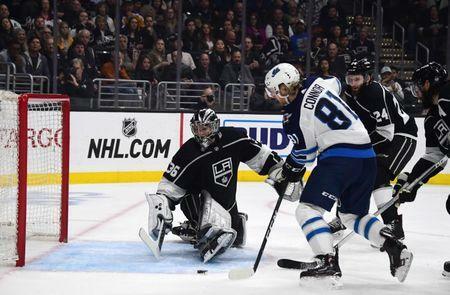 Kyle Connor had a goal and an assist, and Winnipeg won at Los Angeles to extend its lead in the Central Division. Kevin Hayes and Tyler Myers also scored, and Laurent Brossoit made 15 saves for the Jets, who moved three points in front of the Nashville Predators with 10 games left. Sean Walker and Dustin Brown scored for the Kings, and Jack Campbell stopped 25 shots. Jonathan Marchessault had two goals and two assists, and Reilly Smith had a goal and three assists to lead visiting Vegas past San Jose. The Golden Knights won for the ninth time in 10 games. William Karlsson added a goal and an assist, and Mark Stone, Paul Stastny and Cody Eakin also scored goals for Vegas. Golden Knights goalie Malcolm Subban, playing in back-to-back games for the first time in his career with Marc-Andre Fleury sidelined due to a lower-body injury, made 36 saves. Logan Couture scored two goals and Joe Thornton also scored for San Jose, which remained one point short of becoming the second team in the Western Conference to clinch a playoff berth.